 It's the best gift to send father, son, husband, fiancé, boyfriend. Warm Prompt: Full Kit with Carrier Case: 1 Fishing Rod + 1 Fishing Reel + Fishing Line + Various Fishing Lures + Fishing Hooks + Some Necessary Accessories + Carrier Bag. 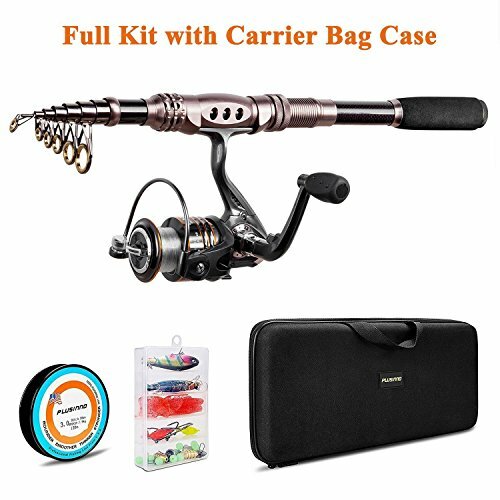  Full Kit with Carrier Case is specially made for novice, including necessary fishing accessories. With this set, there is no need for you to buy any other fishing stuff.  Perfect elasticity, high density Carbon fiber mixed with fiberglass makes your fishing pole hard & durable. Stainless Steel Hooded Reel Seat is anti-seawater corrosion; EVA Fore Grip for comfort. The telescopic fishing rod is portable, and closed length design is convenient carrying around. Power: Medium; Extended Handle.  Instant anti-reverse; Power drive gears equipped for high strength. Deep aluminium spool with double color and one line hole; More short body with large spool and large line capacity. Line capacity: mm/M 0.20/240 0.25/200 0.30/140. Model: HA 3000; Gear ratio: 5.2:1.  We love our customers and stand behind our products. This combo includes our industry leading 12 month warranties. In the unlikely event you should encounter a problem, contact us directly and our friendly customer service professionals will address your needs.